There are just some things she'd never be caught doing. Chattering away on her cell phone about the latest family drama while in line at the grocery store? Never. Updating her Facebook status in the middle of a conversation with a friend? Certainly not. Spouting off her political opinions in mixed company? Not her style. Fumbling through airport security with complicated shoes and a misplaced boarding pass? Wouldn’t think of it. Being a lady isn’t necessarily getting easier these days, but the importance of a woman’s refined influence has never been more important. 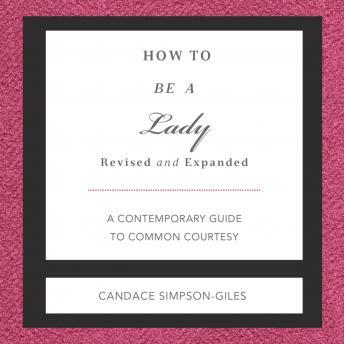 How to Be a Lady reiterates the timeless notions of gracious womanhood, while reconsidering what it means to be a lady in a changing world.